You love racing and compete with passion? Speed awakes your emotions and you like to be taken to the limit? Your race for future will be electric? Fortunately, now SÜDSCHLEIFE is available for you. We come home to you, to your company or to your conference-centre. For you, your customers or your employees: with tradition. Carved out of the genuine woods of Green Hell. For Europe's tallest, six-lane, portable professionell slotcar-track, you need a clean and dry location of 8x12 meters. Our skills are "proofed Nürburgring". We studied real racing and driving events before we created and implemented simulated races. Over a period of more than 25 years we developed Sim-Racing as an entertainment opportunity for incentive groups. This you will recognize in our race attraction " en miniature" with a huge fun. For you we simply call it SÜDSCHLEIFE. The Nürburgring's Südschleife (Southern Loop) was built in 1925. With its demanding 7,747 km course until 1982, it was part of the "Green Hell tarmacs". It led from the concrete loop at the current start and finish line down the hill to Müllenbach and back to the in 1984 presented new Nürburgring Grand-Prix-Circuit. 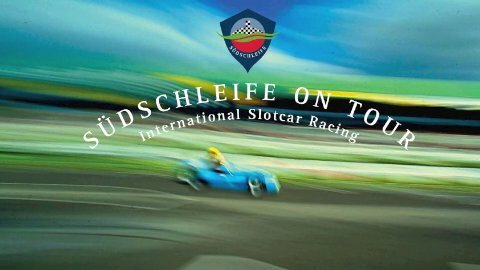 The genes of this complex up and downhill journey steeped in tradition have flavoured our pro slotcar-racingtracks SÜDSCHLEIFE and SÜDSCHLEIFE DIGITAL. An exciting slot car racing was born, served with a tailormade Live Entertainment.